The 2015 edition of the National Day of Peace was marked by a rally and ecumenical prayers at the palace of the President of the Republic.. President Idriss Deby attended this morning (Tuesday, December 12, 2015) at the prayer collective organized by the three religious groups in Chad. It was in the presence of Prime Minister Kalzeubé Payimi Deubet along with many personalities and numerous faithful. 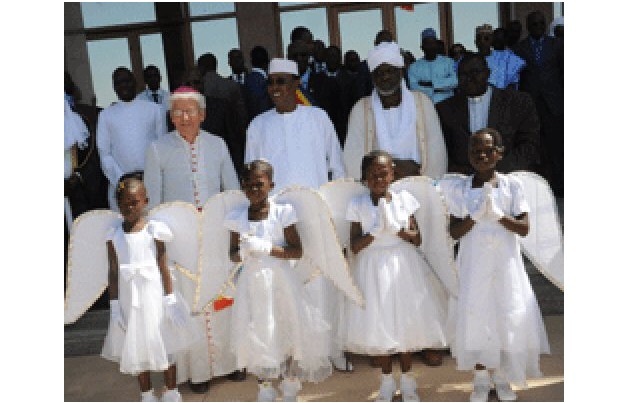 For this 2015 edition, it was a Chad in miniature, represented by its three religions (Muslim, Protestant and Catholic), which made an appointment at the Palace of January 15 to celebrate the National Day of Peace, peaceful coexistence and national harmony. All together, moved by a patriotic instinct and a burning desire to live together, the followers of the three faiths sang the national anthem in its French and Arabic versions. The symbolism was strong. “We must build our country and educate our children by instilling a culture of peace, dialogue, tolerance and mutual respect. May God grant us the grace to be a big happy Chadian family, with the same ideals and the same strength of character that is humility,” said the Secretary General of the Entente of Evangelical Missions and Churches of Chad (EEMET), Pastor Souina Potiphar. He subsequently listed some possible solutions to help resolve some conflicts through dialogue, negotiation or arbitration and the introduction of a peace-building program in our primary schools, secondary and higher. “God is peace, source of all good for humans. Peace is stronger than war. Peace is a guarantee of integral development, harmonious and sustainable, “added the representative of the Episcopal Conference of Chad, Bishop Henry Coudray. Closing the intervention of religious leaders, the president of Chad Supreme Council for Islamic Affairs, Sheikh Dr. Hassan Hissein Abakar deplored the rise of religious extremism and its corollaries. “God preserve us from this cancer that corrodes our society.” He urged his compatriots to be vigilant to this phenomenon which threatens to destroy the social fabric. Dr Sheikh Hassan Hissein Abakar later thanked the Head of State to have agreed to finance the construction of a “Centre for Peace and peaceful coexistence.” “God is with you and with everyone,” he concluded. “God bless and protect Chad and its authorities” was the prayer of the leaders of the three faiths as they raised their voices towards the Most High. The ceremony featured the reading of Quranic and Bible verses, recitals and poems calling for peace and virtue for Chad.